This topic describes the rich, powerful messaging system replaces the Infolog window that was used Microsoft Dynamics AX 2012. Should I show the user a notification, a warning, or an error? Notification – A notification informs the user about events that might or might not be related to the current user activity. A notification can be caused by a user action or a system event, or it can provide information from the program that might be useful. Typically, a notification doesn't require immediate user action. You notify the user by using the info() application programming interface (API). Warning – A warning alerts the user about a condition that might cause an issue in the future. Specifically, a warning is used for data that is in an incorrect state. Although any attempt to use this invalid data might produce an error, the fact that the current state of the data is incorrect isn't an error condition, and the user should only be warned about the incorrect state of the data. You express data validation issues by using the warning() or checkFailed() API. Because of the way that the system handles the cleanup of validation messages, when the warning() or checkFailed() API is used, the return value of validate() should always be set to false. Otherwise, warning messages might not be shown to the user. Error – An error alerts the user about a problem that has already occurred. A user action that has failed is an error condition. Errors can be non-interrupting (passive) or interrupting. In a non-interrupting error, users can perform other activities before they try to correct the issue. In an interrupting error, users can't proceed or complete the task until they correct the error condition. You express a passive (non-interrupting) error by using the error() API. You express an interrupting error by using the box:: API. How do I determine where my messages are shown? The messaging system is deterministic. In other words, the messaging system uses the context of the call to determine the best way to show the message to the user. Messages are shown either in a message bar that appears at the top of pages or in the Message Center, which appears in the navigation bar. The location of the message depends on where in code the message is sent from. If the message is caused by an action that is asynchronous (disconnected), and the user can continue to perform other tasks or even navigate to another page while that action is being processed, the result is shown in the Message Center. How do I change my existing code to use the new messaging system? In many cases, no changes are required. The messaging framework was designed to innovate and maintain backward compatibility for many common scenarios. In some cases, the program might improve the wording of messages. Alternatively, the program might use error() instead of warning(), or warning() instead of error(), to better align with the usage guidance (warnings are for data that isn't valid, whereas errors are for failed actions). In other cases, you might decide that messages that appear on a slider dialog are more appropriate for the parent page. In AX 2012, when a user enters data that is determined to be invalid, or when the data isn't found, the previous valid value is returned to the field, and focus moves from the form to a different window, the Infolog. If the user is doing "heads-down" data entry, he or she must then stop, move focus back to the field that had the invalid value, and type a correcting entry. Additionally, because the invalid value is cleared, even if the user transposed a single number or mistyped a single character, he or she must retype the whole value. The "invalid value" message remains on the screen, and the user must manually clear it. 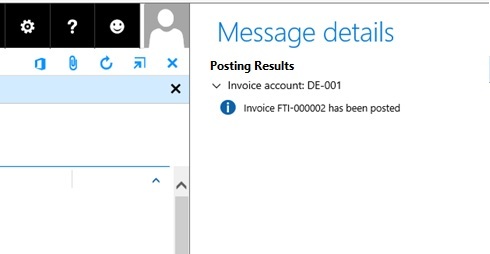 However, in the current version of Microsoft Dynamics, the validation message (which uses the same API) appears in a message bar on the page itself. The invalid value remains but is flagged as invalid. The user can continue to enter data and can correct the validation issue at any point before the data is saved. When a validation issue has been corrected, so that the corresponding message in the message bar is no longer valid, the messaging system removes the message. The timing of message removal depends on the level where the validation logic is defined. If the validation logic is defined at the control or field level, the message is removed when a valid value is entered in the control or field. If the validation logic is defined at the table level, the message is removed the next time that the user crosses a save boundary. The legacy info(), warning(), and error() APIs are still supported. However, these APIs now sit on the framework's new messaging system, and their destination is deterministic. In summary, if the use of the API originates from a page, the message appears in a message bar on that same page. (Drop dialogs and slider dialogs are both considered pages.) The following illustration shows info, warning/checkfailed, and error message bars that correspond to page actions, or synchronous-authored messages that come from info(), warning(), and error(). Note: If the messaging API is called from a slider dialog, but that slider dialog is closed before the message appears, the message is shown in a message bar on the slider dialog's parent page. If that slider dialog is closed before the message appears, and there is no parent page (that is, the parent is a workspace), the message is routed to the Message Center. The messaging API never fails to show a message. If an appropriate host page isn't found, the message is sent to the Message Center. The messaging system supports the legacy validation message APIs (info(), warning()/checkfailed(), and error()), and deterministically routes messages either to a message bar or to the Message Center. The messaging system also clears message bar messages that are related to data validation when the validation is rerun. Additionally, the messaging system includes a new Message() API that lets developers explicitly add and remove messages. This API is useful for displaying informational messages about aspects of the user's experience that aren't necessarily related to data validation. In this case, the message should be shown when the current record is displayed. The message can then be cleared when a new record is shown on the page. The following messaging types are supported: MessageSeverity::Info, MessageSeverity::Warning, and MessageSeverity::Error. Messages that use the Message() API are also deterministic. They can be routed to a message bar or the Message Center. If info(), warning()/checkfailed(), or error() is called from an asynchronous process (for example, a batch job that uses SysOp), there is no page context to consider. Therefore, the message is routed to the Message Center. The Message Center can hold up to 500 messages. Messages are then cycled on a first in, first out basis. Why are asynchronous tasks messages sent to the Message Center? A (potentially) long-running task should not present a message bar to the user, because message bars at the top of a page are used to present information about the current page, not some background task that might have started hours earlier. In some cases, a user who has many background tasks running continues to navigate between pages while the tasks are being completed. Therefore, messages that are presented on the current page to notify the user about background tasks are easily overlooked or ignored. Therefore, by design, background tasks send their messages to the Message Center. When a new message appears in the Message Center, a notification informs the user, who might be waiting for the results of an asynchronous task. Error: Should I interrupt the user? If a task (batch job or other operation) fails, it's often appropriate to notify the user passively. Because the user can correct the issue and retry the operation at any time, he or she doesn't have to be notified immediately. In these cases, the error() API is appropriate, and the user doesn't receive an interrupting dialog. However, in other cases, the user can't proceed until the issue is corrected. For example, if the user tries to save a page that still has invalid data, the client interrupts the user by presenting an error dialog. In these cases, where it's more appropriate to interrupt the user by presenting a dialog, the box:: API should be used. The Message Center appears in the navigation pane. It contains messages that don't require any immediate action by the user and aren't required for the current task to continue. Typical examples include feedback from background processes such as a batch job or report completion. The Message Center can express info, warning, and error statuses. 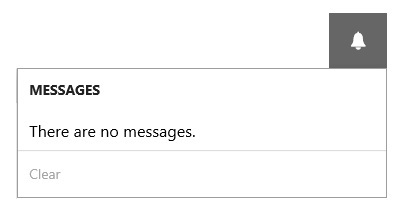 Before it's opened, the Message Center indicates the number of messages that have been received since last time that it was opened. The condition that generated the message. The result if the user continues without resolving the condition that generated the message. This customer is marked as inactive. The transaction on voucher do not balance. The main instruction – This text appears in bold. The message details – This text appears below the main instruction. You can’t delete the reference number because the reference number is used in version %1. You have insufficient rights to perform this export. The root folder for catalog import processing is not configured. Configure the root folder using the Vendor catalog import parameters form. Messages of the error type block the user’s interaction by overlaying the current page with a modal “light box” that contains the message. The deterministic messaging system tries to send messages to the current page. However, not every call from a dialog or slider dialog is routed to that dialog or slider. In some cases, the messaging system sends the message to the parent page instead. This behavior can occur when the messaging system is called while the dialog or slider is being closed. In some cases, the messaging system can be called when the close process for the dialog or slider is started, but the client interrupts the close process for valid reasons. Therefore, there is a "point of no return," after which the messaging system no longer tries to send a message to the dialog or slider, and instead sends the message to the parent page. When the user clicks the OK button on the form is entering its closing sequence, shown in the code example that follows. If the client calls closeOK() or close() directly, then the final result might be the page or the parent page. The results of SetPrefix() don't actively interrupt the user. Instead, the results are collected and stored, and a message bar or a Message Center notification is presented to the user. This message bar or Message Center notification indicates that the related task has been completed, and that there might be messages for the user to review. The notification of results message uses the task's first call to SetPrefix() to frame the message. (This behavior resembles the behavior in Dynamics AX 2012, where the first call is the “title” of the results). In the following example, the text “Posting Results” comes from the first call to SetPrefix(). The user can then click the Message Details link in the message bar to open the Message details pane. You use SetPrefix() to create collections of related messages. This API is largely backward compatible but is presented in a non-interrupting manner. A results window isn't opened directly. Instead, the user is passively interrupted by the appearance of a message bar on the page that started the task that used the SetPrefix() API to group the result messages into a collection. The message bar that notifies the user about the existence of the message collection reflects the severity of the most critical message in the collection. For example, if the collection contains no errors or warnings, the message bar is of the info type. If the collection contains one or more calls to warning(), the message bar is of the warning type. If the collection contains one or more calls to error(), the message bar is of the error type. Note: If a collection contains only a parent and a single message, that single message is sent to a message bar, and no SetPrefix window is used. The use of SetPrefix() is also deterministic. In other words, if you use SetPrefix(), and there is no page context (for example, an asynchronous batch operation), the notification of results is sent to the Message Center, which isn't associated with any page.